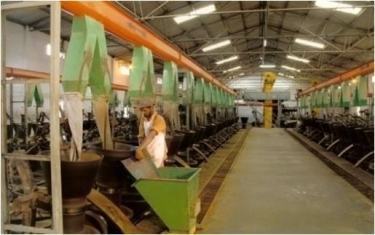 HAFED is having 2 Oil Mills located at Rewari & Narnaul in the State of Haryana. This Oil Mill was established in 1986, for producing Mustard Oil. Initially the capacity of this Oil Mill was 15 MT per day for crushing of Mustard seed which was doubled in 2001 i.e. 30 MT per day. The main product of the mill is `Kachchi Ghani `Agmark' Mustard Oil, the quality of which is comparable with the best available in the country.The processing and marketing facilities in the Oil Mill have also been improved. Various measures have been taken up to enhance the crushing capacity and to improve the quality of the oil. The godowns of 3,300 MT have been constructed in the Oil Mills and a packing section of 1500 MT was constructed at Oil Mill Rewari. HAFED was set up a Modern Kachchi Ghani Mustard Oil Mill at Narnaul (Mohindergarh), Haryana of 30 MT per day capacity in the year 2003. Additional packing sections have been constructed in both the mills with improved packing facilities. All the Food Safety Standards are being complied with by both Oil Mills as per Food Safety Act, 2006. CCTV Cameras have been installed at Narnaul Oil Mill and the same are proposed to be installed at Rewari Oil Mill also for better monitoring & control. Purchase of Mustard Seed on Oil content basis through tenders besides direct purchase from the farmers, has been introduced. Latest model NIR machine of reputed make has been purchased for Oil Mill, Narnaul for instant analysis of oil contents and moisture in mustard seed and in its cake. Hafed Oil Mill, Rewari already has NIR machine. Pungency in oil has been improved to a level beyond 0.30%.